Just as adversity and conflict help make a good story, the two seem to accompany our family on our adventures, and ultimately serve to spice up the experience. It’s just after eight o’clock on a Saturday morning, and our twin children have begun to fight incessantly following two hours of relatively calm play in the house. In short, we’ve got to get out of Dodge, fast. The leaves have fallen. The temperature is in the thirties with a chance of rain or snow, and the kids have some serious wiggles that demand getting outside. What do ya do? 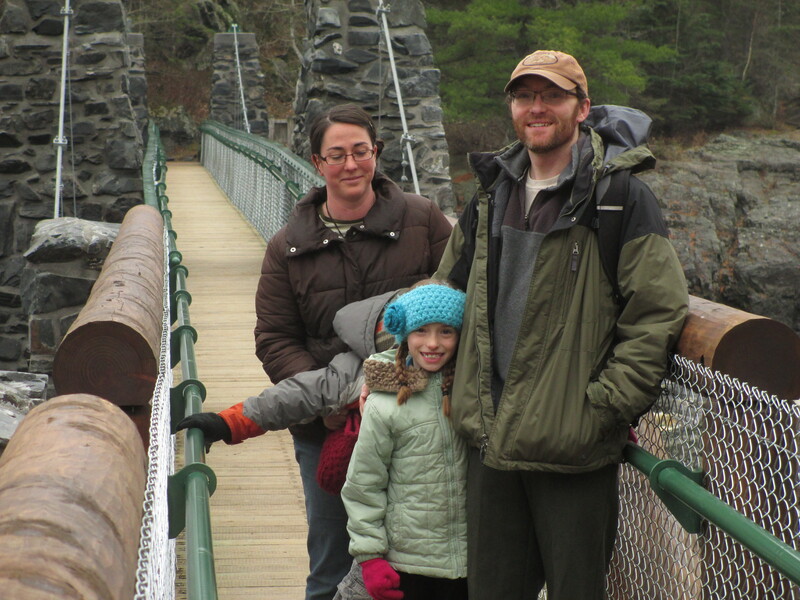 We opted for Jay Cooke State Park, right on the edge of town, which is now nearly fully operational following last year’s substantial flood damage. The brand new Swinging Bridge proudly spans the St. Louis River, and is a very fine Saturday morning destination for the whole family any time of the year. Starting out by running the gauntlet of the gift shop didn’t help any, where we needed to purchase an annual parking pass, and the whining even continued onto the impressive new bridge. Eventually we enjoyed a splendid hike down the Silver Creek Trail, and completed a nice loop back on a cross country ski trail that we scouted out for future use this winter and found to be just about perfect for kids when the snow flies. Following our jaunt of a couple miles among the undulating terrain with the sound of the river penetrating the defoliated forest throughout most of our hike, we enjoyed an awesome weenie roast in the River Inn shelter near the main parking area by the office. A generous wood supply beside the large fireplace makes this a fantastic end to your hike, and the large room really does become quite warm and comfortable. Our jackets were off as we enjoyed an inexhaustible supply of hot cocoa from a thermos and steaming hot dogs. We had forgotten all our condiments and side dishes, so we were left with only hot dogs roasted on a stick, a small amount of ketchup a helpful park ranger mined from the employee break room, and a few small paper plates that helped save the day. Our experience began with whining, and a general surliness as we started out, but gradually the malaise had lifted as we wandered these splendid trails. It was a good reminder to stay the course. It seems our kids do not have an innate love for the natural world as I always have, and it generally isn’t their first choice. It pains me to acknowledge this actually. However, they usually end up having a great time after they realize their whining isn’t going to make us turn around and go home to play with friends and computer games. Slowly we’re trying to teach them that having fun and enjoying life typically necessitates a decision to do so. Just as any family must fight to make quality family time a priority, it is also a struggle to keep today’s kids interested in the wonders of the natural world. Luckily these two important priorities can be handled simultaneously. We can be among amazing scenery, and somehow it is as if they don’t even see it. It takes a great deal of time and patience, but eventually they tend to come around. Sometimes it seems like our family runs on my wife’s boundless optimism, which frequently is manufactured out of necessity. Her fire burns brightly from an inexhaustible love for our family. It’s truly impressive. Though I’m the main driver in these activities, their success depends about 75% on her creative urging on of our kids. Following a fantastic hour spent by the fire, we took the kids to the Duluth Public Library. The peaceful time of selecting books and then quietly enjoying them together in the reading area upstairs was positively serene. This balance of physical exercise and quiet repose is perfect for our needs, and resulted in a memorable day rather than the frustrating experience it could have been if we had stayed in.